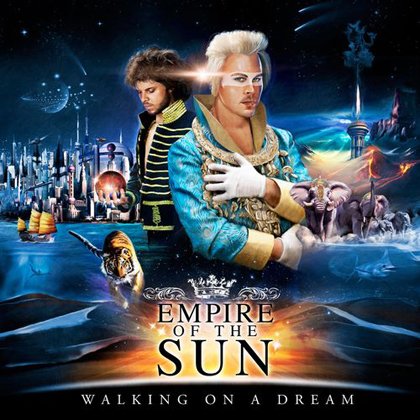 With Walking On A Dream, the debut album by the Australian band Empire of the Sun, comes an intriguing venture into an outer space disco rock. With indie-rock-cooing over psychedelic-electro dance rhythms, the band’s lavish style with overindulging makeup and glitter seems for a lack of a better word–fitting. The duo comprised of vocalist Luke Steele formerly from The Sleepy Jackson and dance producer extraordinaire Nick Littlemore from Pnau, are lost in a world they’ve created. The best song, and the first single, “Walking On A Dream,” is a bubbling dance hit with pulsating rhythm that drives Steele’s achy vocals. The single sounds like an 80’s ballad saturated in easily digestible lyrics like “thought I’d never see / the love you found in me.” Like the entire album, the band sounds familiarly Daft Punk circa “Aerodynamic” grounded in a contemporary throwback disco-rock characteristic of Phoenix or at best MGMT. The band seems promising, yet underneath the makeup is a group finding chemistry. While their song “Half Mast” grooves smoothly with its love crying hook “Oh, oh / Honey I need you”, the song ends with a piano solo that’s comparable to local pub’s 80s cover band. “Swordfish Hot Kiss Nite,” bumps like a club track with a rolling funk, yet it sounds cheesy and overdone by repeating hooks over pumping siren and “woos.” While “Walking On A Dream” is playlist worthy, the other tracks either lack catchy hooks, or sound like day dreamy beats. The talented duo has created a roller skating disco party with a smattering of psychedelic kinks and emotional undertone. Both artists are clearly talented, but on most tracks they don’t compliment each other. Walking On A Dream is more a state of limbo, with an unsatisfying yearning for more substance.